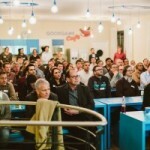 On February 24th, the first Hamburg Web Monday of 2014 took place in our Goodgame café. All 115 places were snapped up within 22 minutes, so we were looking forward to lots of interested guests. The topics for the evening were trends and technical possibilities for websites. Kristin and René, the organizers of Web Monday, opened the evening and our press officer Andreas also said a few words to welcome everyone. 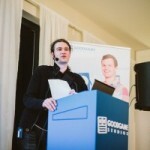 Niels, a developer at Goodgame Studios, gave the first presentation of the evening. He demonstrated how real-time 3D graphics can be utilized in browsers. He used practical examples to show what is already possible, and made a convincing plea based on this: more 3D in browsers! Frank Lutterloh then made his second Web Monday appearance, having already given a talk in 2012. This time he discussed not only potential future trends, but also trends that were once thought to be the future. In some cases, the ideas that cellphone manufacturers had only a few years ago now seem downright bizarre. He concluded that design should be puristic and linear, as only then could it enjoy sustainable and lasting success. After a short break for snacks and drinks, it was time for the final presentation of the evening: Anke Nehrenberg and Alexander Bernhardt gave their talk “The internet is not flat”, which resulted in some light-bulb moments from the attentive audience. They presented current developments on the web with the help of memorable examples. Finally, there was some time for some networking over a cold beer or two. It was a chance for us to reflect with the organizers and guests on a successful event. All in all, we would be delighted to host another Web Monday at Goodgame Studios.